When the North Korean People’s Army (NKPA) crossed the border on June 25, 1950, its large, well-trained army steamrolled through the unprepared ROK forces, starting the Korean War. Believing that remaining neutral would be interpreted as weakness by the Soviets, President Harry Truman won the support of the United Nations (UN) for the defense of South Korea, assigning the military response to General Douglas MacArthur, commander of the American occupation forces in Japan. American reinforcements were sent piecemeal, so the NKPA had gained control of all of Korea except for a small perimeter around the port of Pusan by August. The NKPA had already burned itself out with repeated frontal attacks when an amphibious landing at Inchon caught the North Koreans completely by surprise. Seoul was recaptured on September 25, and the NKPA began to disintegrate. After winning permission from Moscow, Kim Sung-il launches a surprise invasion of South Korea. The ROK army fights bravely but is overwhelmed by the enemy tanks. Major Frank Hallsworth (Ben Gazzara) is an American officer in love with a younger Korean woman and about to divorce his wife Barbara (Jacqueline Bisset). Searching for his wife, he is trapped behind enemy lines but helps organize ROK guerrillas. Meanwhile, Barbara has found herself caring for several orphaned Korean children. Escaping south, Hallsworth briefs General Douglas MacArthur (Laurence Olivier), who has been placed in charge of the UN army that will defend South Korea. Initial American reinforcements prove unable to stop the enemy, and the UN forces end up in a perimeter around the port of Pusan. Amid fears of an evacuation like Dunkirk, MacArthur overcomes the scepticism of the Chiefs of Staff to win support for his plan for a landing at Inchon, far behind enemy lines, which will enable him to recapture Seoul, trapping the NKPA between two armies. However, the invasion depends on the capture of a key lighthouse near Inchon, and Hallsworth is assigned the mission because he is intimately familiar with that area. Although riddled with factual errors, the film is a good presentation of the general sequence of events. The opening narration explains that Kim flew to Moscow in 1950 to win permission for an invasion of its peaceful neighbor to the south, and received heavy weapons and tanks. In reality, the ROK was far from peaceful, it had been denied heavy weapons to prevent President Rhee from invading the north. However, the NKPA were as ruthless as shown, and Christians, intellectuals or governmental officials were rounded up and executed, while all able-bodied men were given a simple choice: volunteer for the NKPA or face a firing squad. The screen MacArthur blames the weak condition of the occupation forces on politicians but it seems unlikely that the real man was even aware of the situation since he never inspected the troops. As American proconsul of Japan, MacArthur had followed a routine that consisted of his home and the headquarters. The only deviations were visits to the major embassies to celebrate their national holidays. During the five years that he had spent in Japan, MacArthur had never left Tokyo, so he never observed the training exercises of the American occupation forces. In fact, his wife represented him on any visits to the occupation divisions stationed outside of Tokyo. None of his staff were willing to stir up trouble by informing him that the troops were better prepared to storm a brothel than a hill held by enemy troops. The NKPA literally steamrolled across the border, since North Korean trains simply rolled across the border to drop thousands of NKPA soldiers in South Korea. With an abundance of artillery, 150 tanks and 200 fighters and bombers, and a larger army, the NKPA was unstoppable, especially since half of its soldiers were veterans of the Chinese Civil War, having fought alongside the Communists against the Nationalists. The border was lightly defended because much of the ROK army had been sent home to help with the harvest. The key problem was that the ROK artillery was unable to destroy the Russian T-34 tanks, and bazooka shells bounced off the tanks. One the greatest fallacies is the misrepresentation of communications. MacArthur did not have a direct phone link from his breakfast table to an American officer at the front during the first day of fighting, and he initially dismissed the invasion as just a major raid. In fact, initial reports were extremely confusing. While the screen MacArthur correctly feared that he was not well-liked in Washington, as the senior general closest to Korea, he was the only choice for command. Few Hollywood movies on the Korean War mention the ROK army, and none present it in a positive light. Inchon was funded by a South Korean, so the South Korean troops are shown as brave but hopelessly out-gunned. Actually, this is an accurate portrayal of the situation. In fact, the NKPA invasion consisted of three prongs: the western side, targeting Seoul, the central corridor, and the east coast. The American embassy staff and American military advisers were all located in the Seoul region, so they witnessed chaos as the ROK chief of staff threw unit after unit to be destroyed by the NKPA juggernaut rather than admit that Seoul had to be abandoned because it was located too close to the border. South Korean divisions facing the other two prongs of the NKPA invasion fought well, but the American commanders had little contact with them. The individual commanders of divisions were quite effective but the chief of staff had been appointed for political reasons and handled the stress of the invasion by falling into an alcoholic stupor, which did not improve American opinion of the ROK army. 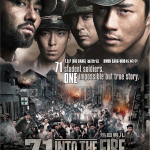 This desire to give a favorable portrayal of the ROK army drove the screenwriters to whitewash a tragic incident. A lengthy scene shows that a key bridge over the Han River was blown up with refugees on it because the NKPA are about to capture it. However, the reality is less attractive. In the chaos and confusion, someone panicked and ordered the engineers to blow up the bridge early even though refugees were still crossing the bridge and thousands of ROK troops were trapped on the other side. Aside from buffing up the ROK army, the Americans are also treated well. Although the cannon and bazookas of the 24th Division, the first American unit sent to Korea, had knocked out several enemy tanks, the Americans are eventually forced to retreat after hard fighting. Actually, the Americans’ WWII-era bazooka shells bounced off the tanks, while the NKPA spread terror among the badly trained US troops by simply outflanking them, so they were quickly overwhelmed. Once the Pusan perimeter had stabilized the screen MacArthur claims credit by stating that he had deliberately used arrogance to lure the NKPA into spreading out their forces, thus giving him time to build defences. The real man had made the same claim, and probably the only people who took that statement at face value are MacArthur himself, his wife, and the screenwriters. Actually, he had thought that he could stop the NKPA earlier and had ordered Lieutenant General Walton “Bulldog” Walker, commander of the Eighth Army, which was based in Japan, to fight for every inch of Korea. Walker had initially complied with MacArthur’s orders by spreading his troops along a long line but when the strategy failed to stop the NKPA, who simply broke through holes in the weakly manned line, he decided to dig in at Pusan, where the smaller perimeter made it much easier to shift troops to repel any major enemy attack. MacArthur hated what he viewed as a passive strategy but happily took credit afterwards. Walker never appears in the movie because it would have distracted from the portrayal of MacArthur as the heroic savior of South Korea, even though it was Walker who led the successful defence, struggling day after day for two months to plug holes in the perimeter, while MacArthur continued his relaxed schedule in Tokyo. 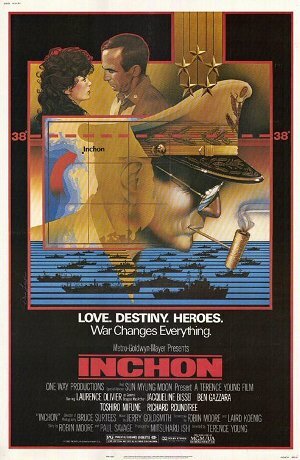 In fact, the movie glosses over the desperate situation at Pusan. Recently arrived British and Turkish troops are brawling with knives because they are bored. Actually, recently arrived troops were busy trying to stay alive. Two months after the invasion, the army and navy chiefs of staff arrive in Tokyo to hear MacArthur’s pitch for the Inchon landing, which will threaten Seoul, forcing the NKPA to fall back and trapping it between two armies, similar to a hammer and anvil, except the hammer and anvil will be separated by a basically all of South Korea. Although the screen Marine general opposes the landing and has to be tricked into agreeing, the real Marines were completely in favor of the assault because they were faced with extinction. General Omar Bradley, chairman of the Joint Chiefs of Staff (JCS), had stated there was no need for amphibious landings in the nuclear age, therefore the JCS had cut the Marines to a shadow of their strength by 1950. Faced with the threat of being reduced to providing token units for ships, the Marines were burning with a desire to prove their value. 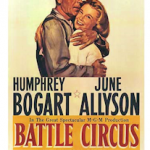 The film correctly shows how MacArthur won over the chiefs of staff with a melodramatic performance. The landing at Inchon proceeded smoothly, to the undoubted relief of the Marines in landing craft. However, showing troops landing unopposed by the token force of NKPA defenders who had been dazed by a crushing naval bombardment would not be a fitting ending for an epic. Instead, the capture of a lighthouse was introduced to add dramatic tension and a climax. Observing the savage street fighting in Seoul, the screen MacArthur displays an impressive nonchalance towards danger. While the real MacArthur spent most of his adult life carefully considering the best pose for the cameras, he was personally brave, bordering on a suicidal. He did have a huge ceremony where he returned Seoul to President Rhee but the script does not mention that MacArthur had wasted Marine lives to ensure that the city was recaptured before the three-month anniversary of the invasion or that Rhee’s own death squads fanned out through the city executing anyone believed to have collaborated with the invaders or expressed opposition to Rhee. The subplot with Bisset and Gazzara is actually good but the portrayal of their relationship is a bit hard to stomach. Will he choose the white woman or the younger Korean girl, or both? Forgiving his cheating, she lets him decide. After all, he is a man, and he was lonely. Even so, Bisset and Gazzara give the best performances in the movie, although the bar was low, really low. Paid a million dollars, a huge salary at the time, Olivier accepted the role even though he knew the film would flop because he wanted to earn a giant chunk of cash for his family. Olivier is too short but the greatest Shakespearean actor of his time was a perfect choice to play MacArthur, the reigning drama queen of the American army. Even though a gargantuan amount of money was thrown at the film, the battlefield scenes look staged and fake. 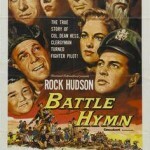 The American military refused to cooperate once it learned that the movie was funded by the Unification Church, which was viewed as a cult in the United States. The Unification Church’s involvement was initially secret, but the movie’s massive budget was completely funded by Moon. Producer Ishii was also a member of Moon’s church. Numerous film critics have ranked Inchon as one of the worst movies ever made. Inchon is not horrible, but it is painful. The movie is an epic tribute to MacArthur. Moon later stated publicly that he wanted the movie to portray MacArthur and his love of God, as well as his battle against tyranny and communism. He succeeded. The three love stories were introduced on the order of Ishii, who did not want the film to be an anti-communism diatribe. Unsurprisingly, director Terrence Young blamed the final mess on the producers’ interference. Probably best-known as the director of the first two films in the Bond series, Terrence Young’s career had started to decline. It did not bounce back after Inchon.